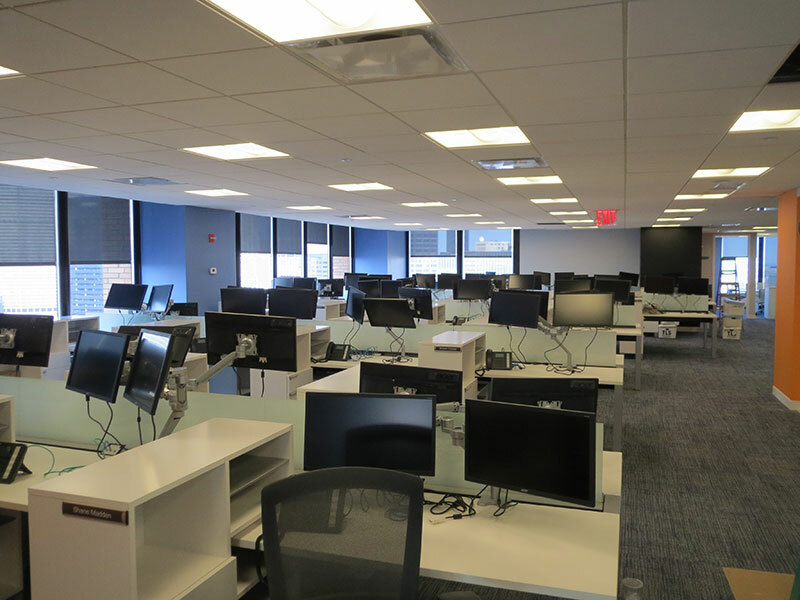 Construction services were provided for the 17,000 SF two phase renovations to Transperfect’s office space on the 40th floor of 3 Park Avenue, New York around their on-going operations. For two months, EJ York Inc. performed preconstruction services whilst waiting for the building permit and six months for the two phased construction period. Our project team worked in collaboration with Transperfect, the Architect- Method Architects PLLC and our subcontractors to deliver a project and an environment well suited to the needs of the client. A phasing plan was established to identify how some employees would be accommodated to allow the second phase to commence and proceed. Communication was critical to the success of the project and the client was actively involved in the construction progress meetings. The free flow of information eliminated confusion and allowed for the seamless relocation of employees as their space was updated. One aspect of the renovation was the reconstruction of the common areas, and offices this phase was sub-divided to maintain ways of entry into the fully occupied office space. Protective barriers were put up to segregate the space from the construction area and help control the dust. Pin-point accurate logistics plans were developed to ensure the safety and work environment for the employees, since this work was done during working hours. Work scope included alteration and remodeling work including demolition, carpentry, millwork, storefront, specialties, finishes, HVAC, sprinkler, plumbing, fire alarm, lighting & electric.